Well, well, well, Hillary-crats all over America must be rubbing their hands in glee: Michael Flynn has been indicted and obviously is going to flip to get a lighter sentence!!! More to the point, Flynn’s worst misconduct involves legally accepting $400,000 from Turkish interests — not Russian, please note — and registering late as a foreign lobbyist. Should he have registered promptly? Sure, but we are talking about $400,000, which is chump change in Washington. Hardly anyone in Washington registers to lobby. Countries like Qatar and China have countless influence peddlers on retainer, but only a few are officially registered with the Justice Department’s Foreign Agents Registration Act office. They just pretend they’re doing PR or something else that somehow falls short of lobbying. Meanwhile, Qatar, among others, pours vast sums into crooked think tanks, who are unregistered lobbyists par excellence. 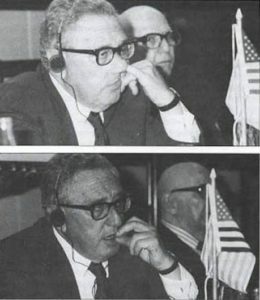 Über Sleaze Henry Kissinger has been peddling influence for decades and has never registered. And by the way, I’ll have a story about his unregistered activities for China next week. I can’r wait for RussiaGate special prosecutor Robert Mueller to haul him in. Trump, Flynn and Manafort are dirty as hell, but there is nothing so far that indicates they did anything out of the ordinary, in politics or business. That’s sad, but true. Mueller’s whole strategy is to get Trump, and anyone else he can bag, on obstruction of justice or perjury or some other charge that was committed after the fact. There was no quid pro quo between Trump and Russia. He should be voted out of office, not railroaded by Mueller and his minions in the press.